FELICITY FLF: 2013 Grey Sport Pony Mare. 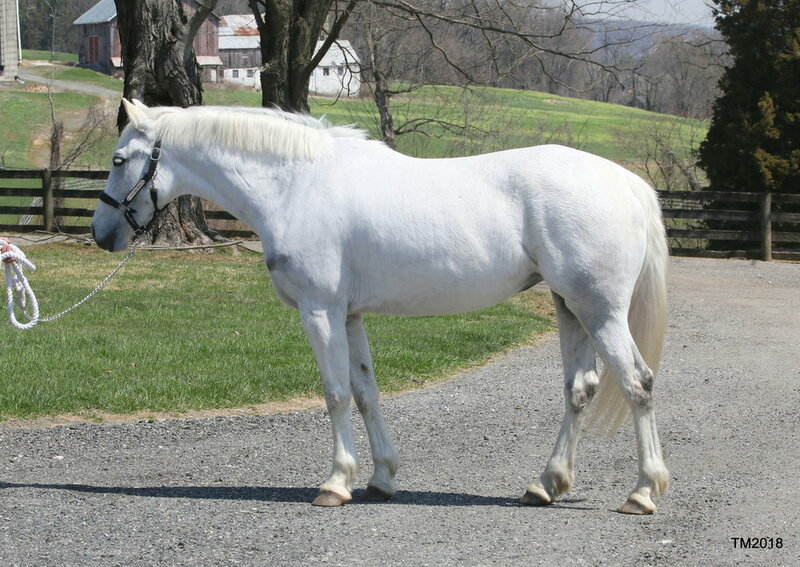 Registered American Warmblood Registry. Sired by the Weser Elms/Approved LeAndros (LeSanto/Landgraf) out of the NASPR/Approved AWR mare Fox Trot. Measures 14.1H as of May 2018. BLOODLINES/BACKGROUND: By blood, Felicity is a Holsteiner/Welsh cross. She is the second full sibling, bred by Flying Lion Farm of FL, sired by LeAndros/LeSanto and out of the previously Thornridge Manor owned Fox Trot. Her older full brother, Lovin Life FLF boasts an exemplary recognized & schooling show record with both Phoebe and a Junior Young Rider. Felicity's younger full sibling was purchased as a 2yo unbroken by an FEI rider from OH; this pair has just completed a successful debut show season in FL 2018! The other younger full siblings are ear-marked for their arrival to Thornridge....exciting times ahead! MAY 2017: Phoebe & Felicity have arrived back to Thornridge/Maryland and are star-ready for Training Level and First Level shows. The decision was made to stick to schooling shows to give Felicity exposure; after all she would be ultimately for sale. During the summer of 2017, Felicity stuck with a 3-4 times a week workout along with a weekly hack over our 100 acres. OCTOBER 2017: Felicity has been successfully competed all of 2017 season with Phoebe. Her demeanor at shows reflects her work ethic everyday in training. To wrap it up: Felicity earned High Score Ride at all but 1 MDA show (yup, every judge is different). She consistently scored 73% at Training Level 2/3 and 70% at her First Level 2 debut. She earned MDA High Score Year End Training Level with an average of 72.8% ( the only average of any level above a 70%!). She was also awarded the Big-Mac Perpetual Trophy for Highest Scoring TR-3 Score of The Year! NOVEMBER 2017: So it is REAL -- FELICITY is a MACHINE! Please view her Nov 2017 video: All trot lateral work thru 3rd level is easy, trot mediums are developing, easy counter canter, amazing medium canter, the start/idea of canter half pass & green single flying changes! She has caught the eye of many top-trainers that want to find a buyer to get Felicity in their barn...how cool! BUT, Phoebe's dilemma has been: How much should she expect out of a 4.5yo?? Felicity is so off-the-radar on age-related training as is...why ask more? APRIL 2018: Felicity has been officially put on the sale market! She is recognized-star-competition ready for 2nd-Lvl and would currently cream most recognized-3rd-Lvl-classes, too! Her single changes are soooo easy and we have currently made them & multiple changes a training priority. Isn't that what every coming 5yo is capable of?? WOWSER -- Felicity shows full potential to make it to Grand Prix sooner then most!!!!! Felicity has gone from a MACHINE to a FREAK OF NATURE: Generally speaking, she is naturally forward-thinking and elastic with an incredible amount of natural suspension, good bone AND the best personality imaginable!!!! Her innate ability to LIFT & reach gives her clear UPHILL tendencies, esp in the canter. This pony shows up to the office EVERYDAY and brings a smile to all who watch her, trainers and judges alike. She is the first choice of Phoebe to ride, everyday :). Felicity is barefoot and maintenance free....we have high-reason to expect sooth sailing in any PPE! Felicity has not grown since Jan 2017 measurement, so we suspect she is at final maturity of 14.1H -- this is well under the limit for FEI Pony Standard. AND, at the rate of her confirmed training, we can now officially call her a FEI PONY READY TO COMPETE!